Last evening U.S. District Court for the District of Columbia Chief Judge Royce Lamberth issued a decision GRANTING the Government’s Motion to Dismiss in the case AOPA filed challenging the Medicare program’s actions relating to prosthetic claims, the August, 2011 Dear Physician Letter and the exclusion of the prosthetist’s notes from having independent value, separate from the physician’s notes as documentation in support of claims. There were some aspects of AOPA’s lawsuit which we felt had to be in place to properly represent the combined interests of the O&P profession. While this path maximized the benefit if the suit were successful, this “big ask” also served to limit somewhat the prospects for success. The objective of our suit was NOT to have one single claim resolved in favor of a specific O&P firm. Rather, we pursued a course that sought, in essence, to overturn all of the claims in which Medicare utilized the criteria in the Dear Physician letter to claw back money or deny payments. AOPA, being a trade association, doesn’t itself file Medicare claims. Finally, with the devastating impact of losses to O&P providers from these audits and denials, we sought an immediate intervention to reverse the losses that ultimately have put over 100 O&P facilities out-of-business. The suit was filed in the context of excessively long delays in getting appeals on claims to the ALJ level. 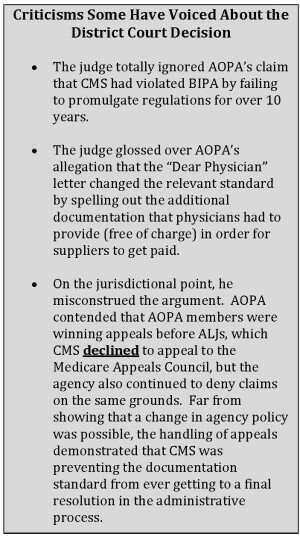 While we cited a limited number of specific claims, in the end, the Court’s decision appears to have rested on the fact that AOPA did not identify specific claims that had gone through ALL levels of internal Medicare review up to, and including not just a decision at the ALJ level, but also a decision at the next level, i.e., by the Medicare Appeals Council. AOPA initiated this case as part of an “all battle stations” approach whereby we have undertaken every possible action from the legislative, regulatory and judicial perspectives to fight for fairness to providers and patients, and against arbitrary actions of Medicare in violation of the processes established in the Administrative Procedure Act to assure that all stakeholders have the opportunity to participate in important government decisions. The U.S. District Court has ruled that we have not touched all the needed technical bases to succeed in the judicial aspect of our efforts. It is often said in the law that there are instances where there is a “wrong without a remedy,” and that seems to describe the outcome of this litigation. Of course we respect the Court’s decision, but we remain unwavering in our belief that the case needed to be filed, and that it has positive outcomes. AOPA and its members are true patriots in the sense of our belief in the proper government processes. The fact still stands that Medicare did not follow the proper processes to change the rules on prosthetists and their patients, and though the Court concluded that Medicare had upped enforcement but not changed policy, we cannot agree. AOPA’s case demonstrated to Medicare that we insist that they go through the proper processes when they seek to change their rules and how they operate. It is noteworthy the Medicare in the past ten weeks has initiated two new rulemakings—on prior authorization and on off-the-shelf orthotics—using the very formal rulemaking process that Medicare circumvented when they changed the rules via the “Dear Physician Letter.” The first of those comment periods, on prior authorization, ended on July 28, and roughly 750 stakeholders from O&P made their voices heard. Medicare apparently did realize we would not go silently into the night. So, while the Court has ruled against our case, AOPA and its members have stood firm in insisting that Medicare follow proper processes, and if Medicare actions in recent weeks are an indicator, we have won a principle. Our resolve in being prepared, in May 2013, and just as much today, to challenge Medicare if they ‘cut corners’ in changing how they treat providers and patients, seems to have delivered an important message, and hopefully forced Medicare to respect that we are prepared to challenge inappropriate actions. Some things have changed—some for better, others for worse—since AOPA filed suit in May, 2013. As noted, there are at least 100 fewer O&P facilities in business, a horrible loss for these providers and their patients. But, as noted above, Medicare seems more inclined to more strictly follow the rules when it makes regulatory changes. Our legislative efforts have gained the attention of members of Congress. 35 members signed a letter to the HHS Secretary in 2013 challenging the Medicare prosthetic audits, and just a couple of months ago 30 Members of the House signed the Duckworth-Rokita letter pressing Medicare on excessive and illegal delays in providing access to ALJ decisions, and charging the agency to stop audits until they fix the ALJ process. We have just seen a new bill, H.R. 5083 introduced which would change the law to assure proper recognition of the prosthetist’s notes. These same efforts have drawn clearer distinctions by legislators between O&P and DME, a fact which might also find its way into statute. There are still other opportunities ahead. There is an interest in using the available processes to look at utilizing the option to petition for modifications to the LCDs, to re-work the rules. Overall, we hope and believe that the outlook is better, not as bleak as it was fifteen months ago when AOPA filed its suit against Medicare. There is other litigation underway. The American Hospital Association filed suit about Medicare RACS about six weeks before the AOPA suit, and they still await a decision on the Motion to Dismiss that the government filed in that case (very similar to AOPA’s, but before a different judge). AHA has also filed suit challenging Medicare’s delay in providing ALJ decisions in accordance with the statute. The District Court issued a 14-page opinion dismissing the AOPA claim, which is available for review on the AOPA website here. Here are the key findings from AOPA’s view. The Court agreed with Medicare that even if the Dear Physician letter had been overturned by the Court, that the Medicare Program Integrity Manual and the Local Coverage Determinations included sufficient basis to support Medicare’s prosthetic claims denials and audits. Notably, the Court pointed to the fact that after the Dear Physician letter, in January 2013, Medicare revised its LCDs, stating that “the revised LCDs state that “records from suppliers or healthcare professionals with a financial interest in the claim outcome are not considered sufficient by themselves for the purpose of determining that an item is reasonable and necessary.” The Court noted that these revised LCDs could be considered because they were completed before our suit was filed, without addressing the fact that they were being applied to claims filed and paid before those revisions existed. While AOPA will continue to consider not only this case but every possible action that can be taken to represent and protect the vital interests of O&P providers and patients relating to the actions on Medicare as to claims, denials and policies, not just for prosthetics but across the entire spectrum of O&P patient care, we conclude this report with a huge “thank you” to AOPA members, as well as to every individual who contributed with financial support as well as their in kind efforts to support the District Court litigation and our efforts via the AOPA Policy Forum, meetings, publications, and our legislative and regulatory advocacy. The O&P field and the patients we serve deserve our absolute best efforts on behalf of these vital stakeholders and we hope AOPA’s commitment to pursue this litigation as one component of fulfilling that obligation. Click here to review the 14 page District Court issued opinion dismissing AOPA’s claims. Questions? Contact AOPA at 571/431-0876 or email Lauren Anderson at landerson@AOPAnet.org. On May 13th, 2013, the American Orthotic & Prosthetic Association (AOPA), through its attorneys with the firm Winston & Strawn, had filed suit in the Federal District Court against HHS Secretary Sebelius, CMS, and the Medicare program. Our suit challenges the absence of appropriate due process around Medicare’s decision in August, 2011 to change the standard for demonstrating medical necessity in violation of the federal Administrative Procedure Act and the Medicare statute, as evidenced in the new physician documentation requirements and related audits of claims for services both before and after August, 2011. It is important for members to understand that AOPA has not challenged the right of the Medicare program to conduct RAC audits—such a suit would fail. Our suit, in essence, says Medicare violated several federal rules and statutes in the way they implemented these changes, violations which AOPA has asserted render the changed standard illegal, and therefore contends that amounts clawed back via audits by Medicare RAC and other auditors relying on that changed standard are also invalid. In essence, Medicare cannot rely on changed standards for claims processing and audits unless and until Medicare goes through the appropriate process, including a public, Federal Register notice and comment rulemaking to develop any changed standard through the right process. So, what has happened with the AOPA lawsuit since AOPA filed its complaint? The federal government is represented in this lawsuit by the Department of Justice, and, as the Defendant, they have 60 days to respond to such a legal Complaint. The Department of Justice asked for, and was granted an additional week to craft its response, which it submitted late in the evening on Friday, July 19. As expected, the DOJ/Medicare response to our suit was to file with the court a Motion to dismiss our lawsuit. The DOJ/Medicare maintains that the Federal District Court does not have the jurisdiction to hear and decide this lawsuit, and also that AOPA has not ‘exhausted all of its administrative remedies’ within the Medicare system itself, and for other reasons has failed to meet the requirements imposed on anyone who wants to sue Medicare. The Medicare statute makes it rather difficult for aggrieved parties to sue the Medicare program. Congress set up some strong restrictions limiting judicial review of Medicare program decisions. For example, it is difficult, if not impossible, to get your day in Court if you want to prove that Medicare pays too little in its reimbursement for a particular service because Congress excluded such claims from any right of judicial review. That being said, AOPA’s attorneys studied all of the rules very carefully before filing our suit and they think we have a solid basis to bring this matter to trial in the Federal Courts. They will be filing our rationale in our own submission to the Federal District Court within the next two weeks, contesting the DOJ/Medicare Motion to Dismiss. This is a critical juncture in our litigation—our prospects for success will expand significantly if the Court does not grant the government’s Motion to Dismiss. All of us will doubtless agree that there has been little, if any, good news on RAC and related audits on O&P over the past 23 months. But something quite remarkable has happened in the past couple of weeks, something that we attribute to the filing of AOPA’s lawsuit. One of the major claims AOPA has made in our suit is that the CMS audit contractors have inappropriately applied the new standard articulated in the August 2011 Dear Physician Letter retroactively to claims in 2009 or 2010, well before anyone had any reason to think the standard had changed. Over the past two weeks, we have heard from a fair number of AOPA O&P provider members that the CMS RAC contractors had notified them that audits of claims with dates of service before August, 2011—the very claims that were contested by one of the AOPA suit’s most vociferous assertions—have been cancelled. Just this past week, AOPA has gotten word from two separate members in different states that audit contractors explained these cancellations by saying that they had received a notification from CMS instructing that any O&P prosthetic audits relating to claims with a service date before August, 2011 be cancelled. CMS has said nothing to explain this action, but they seem to have recognized that they did make an important change in the standard via the August, 2011 Dear Physician letter AND that it is unfair and inappropriate (if not illegal) to apply that new standard retroactively. This is not the first time CMS has initiated major changes in policy of RACs as a result of a lawsuit being filed. Earlier this year, the American Hospital Association (AHA) sued CMS relating to what AHA deemed to be inappropriate and confiscatory actions by CMS audit contractors. Shortly after the lawsuit was filed, CMS announced a new interim rule whereby if audits determined that a Medicare patient should not have been admitted as an in-patient under Part A to receive a service/surgery/procedure, Medicare (instead of its old policy which had been, by RAC audit, to claw back every dollar of the claim paid on behalf of that Medicare beneficiary) would allow the hospital to re-file a claim under Part B for the amount Medicare would have paid for that patient on a claim submitted had the service/surgery/procedure been received on an outpatient basis. So far, this has not resulted in any change in the lawsuit itself. It is possible that the government decided it would be easier to defend its position in the lawsuit if it adopted prospectively a more reasonable position. It is very possible that the action we have reported, whereby CMS has instructed its audit contractors to cancel O&P prosthetic claims relating to dates of service before August 2011 is simply a similar case of the government deciding to in some sense “cut its losses” by changing its policy so it can report in Court that it no longer pursues the retroactive claims. Nothing reported either from CMS or the DOJ/Medicare legal team sheds any further light on this action. We must caution AOPA members not to infer from this that there is any probability or certainty that CMS will adopt a consistent and rational policy, namely, there is no indication or assurance whatsoever that CMS/Medicare will return the dollar amounts its auditors have already collected retroactively as to prosthetic O&P claims where the date of service was before August, 2011. That would make sense to all of us, but as we know, Medicare very often does not act logically. We hope that this might be the eventual result of either Medicare attempting to treat O&P prosthetic providers more fairly, or as a result of the ongoing litigation, but at this point there is no way, and no information at our disposal to speculate about what the government might do. We are left with the encouraging fact that CMS appears to have instructed its audit contractors to cancel existing claims under review for prosthetic O&P services where the service date is prior to August, 2011, and presumably NOT to initiate new prosthetic O&P claims for that retroactive period. If true, that is indeed a positive step/outcome from the filing of the AOPA lawsuit. Review the complaint AOPA has filed. Review the chronology of AOPA actions related to RAC, other audits, and pre-payment reviews. Read the letter to members from the AOPA board, Learn how you can support the lawsuit and save the future of O&P. Review the list of litigation fund supporters here. CMS has announced plans for a second conference call meeting to discuss its Clinical O&P Template, slated for Wednesday afternoon, July 31, beginning at 1:00 pm, EDT – details can be accessed here. AOPA has written CMS Administrator Tavenner (dated Jul y 22, 2013) raising concerns about aspects and processes relating to the template. This letter can be accessed here. If you wish to read the DOJ/Medicate Motion to Dismiss, it is accessible here. Sadly, the Federal District Court dismissed the complaint indicating AOPA did not have standing as a plaintiff but did not address the merits of the case. While this is a disappointment to all, and especially those who generously supported the heavy costs involved, CMS may have taken note of this litigation’s primary claim that due process was violated in implementing the “Dear Physician Letter” and whether there is any relationship or not to AOPA’s lawsuit, we have since seen instances where CMS has followed due process in promulgating some of their regulatory actions. Thank you again for your support of our efforts.